Its five days before Passover. This is the day that Moses had instructed every family of Israel to choose a lamb to eat on the Passover. It must be young. It must be male. It must be without blemish. For the disciples and the spectators, it was a day of optimism and hope. “For all the mighty works they had seen” Him do, there was no telling what great things He could do if He were to be their King. ‘Blessed is the King who comes in the name of the Lord!’ . But He comes to be their Passover Lamb; to atone for all of their sin; to establish a peace in heaven between them and their God that this world cannot give. •	In five days the blood of this Lamb will mark the cross beam, that death would pass over, not just Lazarus, but all who live by faith under this cross. •	In five days this Passover Lamb will be bound to the cross and roasted over the fires of hell and the faithful of God will participate in His sacrifice by eating His flesh. THIS IS THE PALM SUNDAY. Palm Sunday begins where the Church Year began all the way back in November on the 1st Sunday in Advent when we heard this same reading. He set His face to go to Jerusalem even while He sat at the right hand of God the Father in heaven. He is the Passover Lamb who will atone for the sin of the world, once for all. That word “passion” is closely connected to the word for ‘SUFFERING.’ And indeed this week contains all of the ‘suffering’ that the entire realm of human history has ‘suffered’ and will ‘suffer,’ all ‘suffered’ by this one man, Jesus of Nazareth. But this same word also has to do with ‘DESIRE’ and the inner compulsion that drives us to do what we do. “He has a ‘passion’ for understanding classical music.’ ‘She has a ‘passion’ for protecting her children.” We strongly desire to do those things we are ‘passionate’ about. Our ‘passions’ are what drives us to do what we do. It’s interesting, (in a very sad way), that in all of the 27 times this word appears in our New Testament, it speaks about our 'passions’ in a very destructive way. James writes, “What is it that causes quarrels among you? Is it not this, that your passions are at war within you?” (4:1). But when we speak of the 'PASSION OF CHRIST,' we are speaking of the One who knew no sin. And His 'passions' are pure and holy. The thing that drives Him to do what He does is His love for 'YOU.' His love for the world and for you is what 'drives' Him. 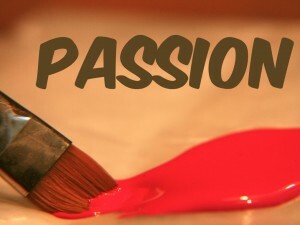 His 'passion' is to save you from your passions. •	to suffer death, even death on a cross for your sins so that you would not. •	To be made nothing so that we would have everything, even heaven. •	To be the Lamb who was slain so that you may have His body to eat and His blood to drink for the for the forgiveness that only He can give you. And on Passion Sunday we hear the Passion account from one of the four gospels, today the Passion according to St. Luke. It is read in the most solemn reverence both today and again on Good Friday, because this is the core of the Holy Scriptures. It is to these final days and hours of this particular Passover in Jerusalem, that all of the Prophets point forward and to which all of the Apostles point backward. As we hear the account of the Passion of our Lord, we hear it not only as ancient history, but also as current event and everything that is said and done by those in the account is said and done by us. •	We are Judas who betrays our Lord. •	We are Peter who denies Him. •	We are in the 'assembly of elders' who revile Him and bear false testimony against Him. •	We are Pilate who wants only to be rid of the inconvenience Jesus causes. •	and among the 'criminals' crucified with Him who railed at Him. And His 'passion' is for all of these. And therefore if you are not one of these, then we ‘self-exclude’ ourselves from those for whom He was driven to suffer and die. But when we confess that we are all of these rolled into one, ALL OF US, driven by our 'dishonorable' and 'worldly' and 'sinful' passions just as they were, then, we hear the account of the Passion of our Lord rightly. Because only when we take our place in the motley cast of characters with their ungodly passions, are we ready to take our place in the holy company of saints whose passions have purified by the blood of the Lamb of God, shed for us. Now it is OUR PASSION to hear His word of forgiveness sounded into our ears and settled into our hearts. Now it is OUR PASSION to take up our cross and follow Him. This is PALM SUNDAY and PASSION SUNDAY.